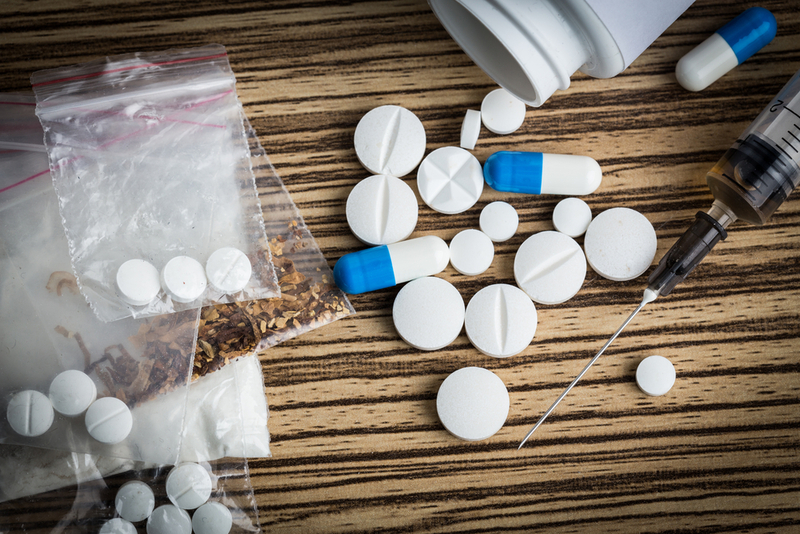 Opioid addiction is becoming a global problem and is currently the primary cause of drug overdose in the U.S. Opioids such as morphine and codeine are synthetic drugs that cause the same effect as opium. They act on the nervous system to reduce pain and come in the form of capsules, tablets or liquid. Using and abusing opioids can lead to physical dependence along with opioid withdrawal symptoms. Other common opioids include fentanyl, hydrocodone as well as heroin. The terms opiate and opioid are often used to describe the same thing, despite having distinctive meanings and practices. The term opioid was originally used to describe the synthetic substance that mimics opium. Nowadays, the term is used to describe a whole class of substances that are either used to stimulate or derived from opium. Opiate indicates to a natural drug that comes from the opium poppy. Both synthetic and natural forms of the drug can be incredibly addictive and cause severe opioid withdrawal symptoms. Even though opiates are prescribed for pain relief, extended use can cause opiate, or opioid, abuse and addiction. 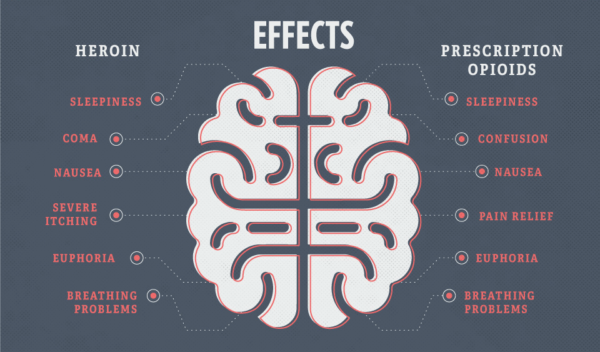 Opioids cause a sense of euphoria or wellbeing that can become addictive to certain people. It is intended to be used for pain relief, though some people develop a tolerance to it, which means they require more of the drug to experience the same effect. Some individuals then end up developing an addiction. They start to become consumed with getting opioids or even engage in illegal activities to maintain their fix. Death from respiratory or cardiac arrest can occur after a person takes a high dose of opioids. Additionally, tolerance to the euphoric effect of the drug develops at a faster rate than tolerance to the life-threatening effects. This can cause people to overdose by accident when they are trying to achieve a greater high and end up taking too much. Opioid withdrawal symptoms range from mild to severe and depend on how dependent the person is on an opioid drug. Dependency is often tied to the duration of time taking the opioid drug, the drug that was taken, how it was taken, dosage amount, co-occurring disorders (or dual diagnosis) and underlying medical conditions. In addition, certain environmental and biological factors, such as previous trauma, family history of addiction or unsupportive and stressful surroundings can also have an effect. What is the timeline of opioid withdrawal symptoms? Some of the cravings and psychological withdrawal symptoms for opioids may last longer than a week. Psychological support and therapy offered by a mental health professional as a part of a comprehensive drug addiction treatment programme can minimise the side effects and symptoms of withdrawal. What are the stages of opioid withdrawal? Choosing to get sober after using opioids is not an easy decision, especially when you think about the withdrawal process. Even individuals who are not abusing or addicted to opioids are likely to experience some form of withdrawal when they stop. While the thought of quitting opioid use can be overwhelming, its an essential step in your path to sobriety. Understanding the stages involved in opioid withdrawal can help you through the process. The first stage of opioid withdrawal tends to be the most uncomfortable and painful. Opioid withdrawal symptoms typically start eight to sixteen hours after your most recent opioid use. Likewise, users of faster-acting drugs such as heroin usually experience opioid withdrawal symptoms are a quicker rate in comparison to prescription drug users. Methadone users, on the other hand, may not experience symptoms for up to 30 hours. Stage one typically lasts for a day or two but can be longer in certain situations. Many people think about relapsing during this stage due to their discomfort. Opioid withdrawal symptoms generally peak during the three-day mark and can last up to around five days. Even though you might feel some discomfort during this stage, it is usually much more tolerable than in phase one. During stage two, you may have a hard time eating, particularly solid foods. Vomiting and diarrhoea can lead to severe dehydration so you must remember to keep drinking water. Its also beneficial to try to eat to have enough strength to keep going. It is easy for people in stage three to think that they have made it and have overcome the withdrawal period. While you have made it through the tricky part, the process is not entirely over just yet. During stage three, you may still experience symptoms such as insomnia, nausea and anxiety. Even though they are likely to be less intense than the other two phases, you should still pay attention to them. You may still develop cravings after your physical symptoms are gone. You may also want to return to your normal life, but it is important to stay in treatment for a bit longer to help your chances of avoiding relapse and maintaining sobriety. Ideally, you want to keep your mind and body active at this point. Engaging in low-stress activities, such as light exercise and yoga, can help distract you from the situation. Even though going through opioid withdrawal can be extremely difficult, remember that it is the initial step towards recovery. What are opioid detox options? There are several detox and treatment options for removing opioids from the body, with some being more comprehensive than others. For example, medical detox involves both psychological and pharmacological treatment methods under the close supervision of both mental health and medical professionals. Medical detox takes place in a comforting and safe residential setting whereas standard detox can be achieved on an outpatient basis. Since opioid withdrawal symptoms can be severely uncomfortable, medical detox provides a more comfortable and safer way to detox. All vital signs, like body temperature, blood pressure, heart rate and respiration levels can be closely monitored during medical detox. Additionally, medical detox centres may use medications to regulate body and brain functions if it is necessary. Furthermore, mental health professionals can evaluate and stabilise individuals during medical detox. Even though there isn’t a specific detox timeline, since everyone withdraws in their own way, medical detox generally lasts between five to seven days. What takes place during medical detox? 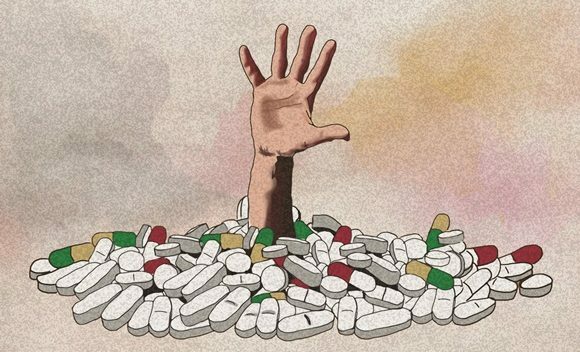 It is crucial that a person does not suddenly stop using opioids drugs without physical and emotional supervision and support since withdrawal side effects can be potent and may also have dangerous complications. During medical detox, medications like antidepressants, anticonvulsants and other symptom-specific pharmaceuticals may be used to control the more problematic withdrawal symptoms. Medical professionals may also help a person wean off opioids by slowly reducing, or tapering, the dosage during detox. This allows the opioids receptors to stay filled and inhibits the beginning of severe withdrawal symptoms. Withdrawal and drug cravings may also be managed by substituting short-acting opioids, such as heroin, with longer-acting opioids like methadone. What medications are used for opioid withdrawal? The goal of detox is to stabilise a person who is dependent on opioids in both a physical and emotional manner. To accomplish this, detox may involve both psychological and pharmacological therapy methods. Buprenorphine, a partial opioid agonist, is commonly used during opioid detox and addiction treatment as well since it stays active in the body for longer than the majority of opioids. It also requires less dosage amount. In addition, partial agonists do not often cause the same euphoric feeling, or high, as full agonists, which makes them less prone to being abused. A In fact, buprenorphine stops being effective after some time, which makes it even more of an abuse deterrent. Naltrexone and naloxone are opioid antagonists that bind to opioid receptor spots in the central nervous system and prevent other opioids from filling them. Therefore, if a person tries to take a drug such as heroin while on an opioid antagonist, the drug won’t cause the same high. Instead, it may actually trigger precipitated withdrawal syndrome. Precipitated withdrawal is an abrupt and rapid start of withdrawal symptoms, which can be very intense and can prevent a person on an antagonist from trying to abuse an opioid agonist simultaneously. Naloxone is combined with buprenorphine as an inactive agent to prevent relapse in drugs such as Zubsolv and Suboxone except if the drugs are changed and then abused through injection. Naltrexone products such as Vivitrol, Depade and ReVia are commonly used to help prevent relapse once detox is complete and opioids are entirely removed from the body and brain. How does medical detox fit into a comprehensive treatment plan? Addiction is a relapsing and chronic disease that has both emotional and physical symptoms and side effects. Therefore, treatment must be comprehensive to be effective. Medical detox takes place over a relatively short period and can offer the first steps towards a successful recovery. Relapse is common for people who struggle with addiction since it may appear as though returning to drug abuse may provide relief. However, after not using drugs for a specified period, a person tolerance to drugs may decrease, and relapse following detox can be even more dangerous since it can increase the risk of a fatal overdose. Since medical detox helps smooth out opioid withdrawal symptoms, reduces side effects, prevents severe complications and reduces drug cravings, it can be a good start towards recovery and help a person maintain long-term sobriety. Following detox with individual and family therapy, counselling, support groups and education and treatment at an opiate addiction treatment centre can help a person avoid relapse and stay sober for good. After an initial assessment, we determine whether our client requires medical detox before starting addiction treatment. If detox is needed, The Dawn has an onsite detoxification facility that offers 24-hour medical supervision and support from our licensed team or addiction professionals. Once detox is complete, our clients can start their comprehensive addiction treatment programme. 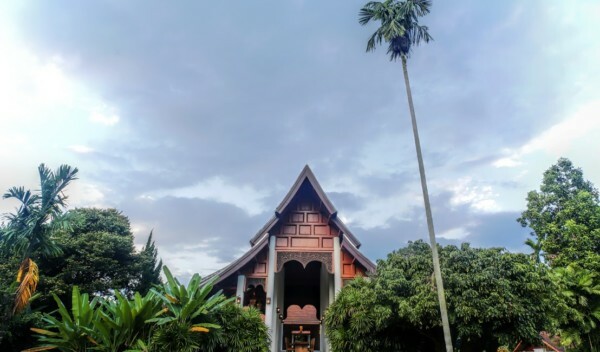 For each client, we offer a highly personalised and intensive addiction treatment programme that is customised to cater to our clients unique requirements. Through a holistic and non-religious approach, our clients receive the most useful tools to overcome their addiction. We also offer different methods of counselling therapy to help treat opioid dependence, including Cognitive Behavioural Therapy (CBT), Contingency Management, Motivational Enhancement Therapy (MET) and 12 Step programmes. CBT is a form of therapy that teaches a person how to recognise and stop negative behaviours and thought patterns. It helps a person become aware of their triggers as well as situations and feelings that led to opioid addiction in the first place. Through CBT, our clients learn how to react differently when any of these occur or how to avoid them entirely. Additionally, contingency management offers incentives to support positive behaviours such as maintaining sobriety. It includes a voucher-based approach that enables clients to earn points if they pass a drug test. These points can then be used for goods that reinforce healthy living. MET is beneficial to people with addiction since it increases motivation and commitment during their recovery. It is generally used during the early stages of treatment. MET also reduces a personai??i? ?s resistance to change and decrease their denial. 12 Step programmes such as Narcotics Anonymous (NA) are peer support groups that give recovering addicts support and guidance during and after treatment. Unlike group therapy, 12 Step programmes are not lead by a trained psychologist but a volunteer chairperson instead. Overcoming addiction is a process that involves work, guidance and support over an extended amount of time. To help you maintain sobriety, our staff help you identify and manage your triggers as well as determine which coping mechanisms work best for you. We also help you create your own relapse prevention plan, which is designed to prepare you for circumstances where relapse might be tempting. Aside from giving you a strong foundation for your recovery journey, you will also learn how to use mindfulness and create a healthier lifestyle. Aside from undergoing detox and counselling, we also understand the importance of ongoing support and services following treatment. At The Dawn, we offer systematised online aftercare support to give you the guidance and care you need to overcome your addiction. Like our treatment programmes, we personalise our aftercare support programme to suit each clients unique needs. Our aftercare programme takes place online so you can access it from anywhere in the world. We provide individual and group therapy options using video technology. Our online individual sessions are ideal for those who are not comfortable with being involved in group therapy. These sessions are also suitable for individuals who need some additional support or cannot attend group therapy sessions due to scheduling. Similarly, online group sessions involve a maximum of eight participants and allow all participants to interact and converse with each other. A counsellor is always present during group sessions to facilitate discussion, evaluate progress and give guidance or answer questions as they arise. Group counselling sessions are available at scheduled times during the week and take place in the early mornings and late afternoons in order to cater to different time zones. If you or your loved one is facing a problem with opioid addiction, now is the time to make a much needed change and start working towards sobriety. Contact us today to receive a no obligation assessment to find out how we can help. You can also call us on one of our toll-free numbers.